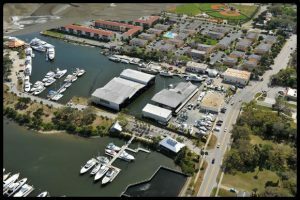 Daytona Marina and Boatworks is a full-service marina and boat yard. The marina has been around since 1903. Some would say we have history on our side. The role of the marina has changed over the hundred plus years of its existence. Initially, it had been used as a transportation hub for the east coast, as well as a base camp for Intracoastal waterway construction. It has also been a site of naval shipbuilding during and around World War Two, later for race boat construction, and commercial and pleasure fishing boat building. Currently and over its modern history as a boutique marina and a yard that specializes on refurbishing pleasure boats. We are locally owned and operated and offer many modern amenities. The marina is conveniently located in downtown Daytona Beach on the west side of the Halifax River. The staff are one of the friendliest on the east coast. We are a short walk to the Downtown Daytona shopping district. Our marina is in a safe harbor open year round that offer annual, seasonal, monthly, and transient dockage. We have over 100 slips and can accommodate boats up to 200 feet in length. We have on-site staff and security that offer fuel and other services 24 hours a day.